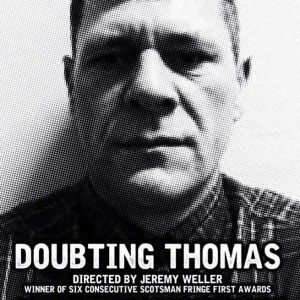 Doubting Thomas, the play that tells the story of Thomas ‘Tosh’ McCrudden, has been the talk of the Edinburgh Fringe. Pamela Morrison went on a journey with this ‘lost boy’ to experience a powerful tale of reintegration, responsibility and redemption. As a new member of the CYCJ practice team I am keen to get out and about and learn as much as I possibly can. I jumped, therefore, at the opportunity to go along to the Edinburgh Festival to support a good friend of the Centre, Tosh McCrudden in his show ‘Doubting Thomas’. Having attended the Edinburgh Festival several times before to see comedy performances I wondered how the subject matter of the show was going to work. Often when working in the area of youth and criminal justice you can find yourself in a bubble where your networks involve others who are like-minded and display views that may not be held by the general community. I was excited and curious to see how the show would be performed, to show the truth of the story without it being glamourised for the purpose of the audience. I was soon to be pleasantly and humbly surprised. The theatre was almost full and I was immediately taken aback by the apparent popularity of the show. The offer to the audience of being taken “on a journey, to a place and a world that at times may feel uncomfortable to them” was clearly something that people wanted to experience. The performance started with ‘doubting Thomas’ (Tosh) discussing with the director the importance of sharing his story and his feelings of nervousness and anxiety in doing so. From the offset the message was clear “Judge me now, don’t judge me for the past” and the term “lost boys” was introduced. The passion and dedication beamed from Tosh and the other performers. I was moved by that they had the bravery to share their stories despite them clearly having a sense of sadness and helplessness towards their past. It depicted relationships and ‘friendships’ they held at a difficult time in their lives and how these fed into a cycle of offending and negative decision making. Tosh discussed feeling unable to trust people, feeling trapped, being unable to show emotion and feeling let down by society. This was a theme that was revisited throughout – lost boys, forgotten and discarded by society. One scene that stood out for me as being particularly hard-hitting was that of Tosh and the director who was eager to share Tosh’s story, but in doing so wanted to somewhat dramatise the story to represent the level of violence. Tosh’s powerful and energetic message left the audience in no doubt that the violence discussed was in no way something to be dramatised. He described it as “passing a box of fear” with each box of fear being held by an individual for the rest of their days. The pause after this scene was very moving, the audience was stunned into silence. The scenes in the performance switched from those depicting Tosh’s story to those where he reflected on his life and his journey. He was able to acknowledge the point in his life, whilst in custody, where he could feel that change had occurred; for the first time he could experience feelings of empathy that he hadn’t experienced before, the feeling that he was more than the person he was pretending to be. Finally, he could feel his mask had come off. Following this, it hit him that he wasn’t the only one, as he looked at others it was clear that they all had masks on and for the first time he was able to see past this, into their eyes, their mistakes and their soul. This change allowed him to support others which in turn gave Tosh a feeling of having importance, worth and purpose. This was the beginning of the change he experienced and was the beginning of the challenges he would face in doing so. In the community he had a reputation and those ‘friendships’ that had meant so much to his life before were now testing his will and desire to change. This continues to be an area of importance where the difficulties of embedding back into society are often not overcome and individuals find themselves back on the cycle of offending. Tosh was clear in his reflections that taking individual responsibility is important, however, it is also the responsibility of society, those living in communities like you and I, to ensure that ‘lost boys’ are found. Throughout the play I was impressed by the high quality of acting that was displayed by Tosh and the other performers. To my knowledge, none had been trained as actors and it was striking that they were able to conduct themselves in such a professional and instrumental manner. Although, it soon became clear that Tosh, amongst others, had been ‘acting’ for years, acting every day for the majority of their lives, acting as people that were not a reflection of their true selves – something they had become very good at. Pamela Morrison is a Practice Development Associate with CYCJ. Read more.